The ACU-DRUM Pivoting Drum System is a sediment flushing device designed to remove settled debris from storm water detention tanks, combined sewer overflow (CSO) retention tanks, sanitary sewer overflow (SSO) equalization tanks and reservoir floors, using a single flush. It has been used in CSO and SSO applications and can be used in agricultural and industrial applications to clean any batch process tank, reservoir or basin. 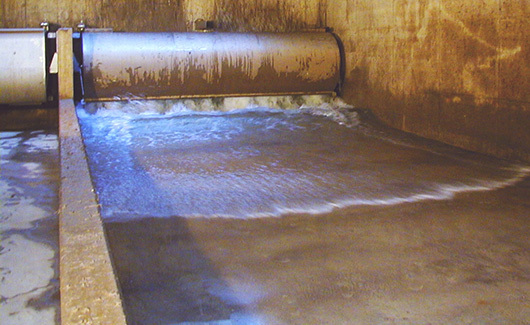 The system operates by releasing a torrent of water stored in the pivoting drum. The resulting flushing wave progresses down the entire length of the flush way, pushing the settled debris ahead of it. The re-suspended debris is then carried by the flush water to the treatment plant for disposal. The pivoting drum system has several advantages over other types of sediment flushing devices. Although similar to the ACU-TIP tipping bucket in design, the ACU-DRUM pivoting drum differs in that it is designed to use in-situ water for flushing. 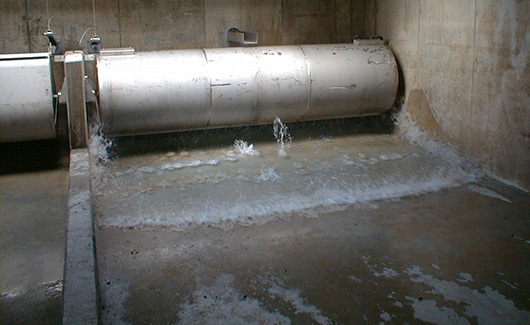 This sediment flushing device is installed at the tank’s floor level. The only mechanical components of the system consist of two permanently lubricated end bearings and the release mechanism. Therefore, the need for maintenance is reduced, assuring an economic and trouble free operation. The ACU-DRUM pivoting drum can be installed in new tanks or easily retrofitted into existing installations. The following components are included in the ACU-DRUM Pivoting Drum System: the pivoting drum, the supports, the bearings, the anchoring system, the float and the release mechanism. The ACU-DRUM pivoting drum can vary from a model GAD-60 to GAD-200. The GAD-60 holds 60 gallons per foot (750 L/m) of device length and the GAD-200 holds 200 gallons per foot (2500 L/m) of device length. The ACU-DRUM’s model selection is based on the flush way length and the slope of the tank floor. To date, the maximum flushing length has been 120 feet (36 m). The ACU-DRUM pivoting drum’s unique design allows it to be filled using in-situ water and comes in either a self-filling or externally filled model. 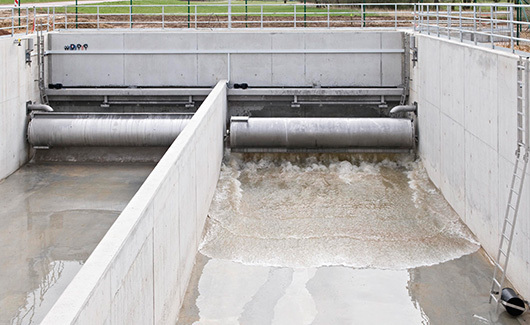 The self-filing model normally rests in the flushed position and is equipped with two integral floats which cause the sediment flushing device to rotate upwards and fill with in-situ water as the tank fills. A float located in the sump rises with the water level in the tank and activates the ratcheted latching mechanism. The externally filled model is designed to remain in the latched and upright position with the use of integral counterweights and is filled by a pipe. Influent water is first diverted into the ACU-DRUM pivoting drum before filling the tank. In either case, when the water level in the tank drops, a float located in the sump activates the release mechanism resulting in the flush. 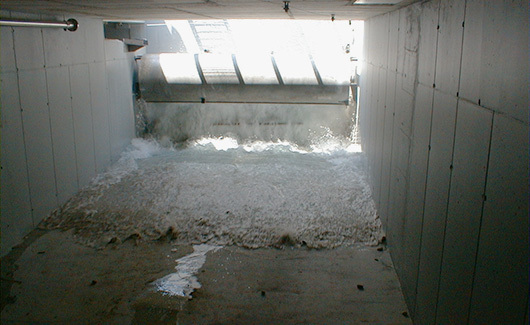 The sediment flushing device pivots sending the stored water onto the floor of the tank resulting in a torrent of water running down the length of the flush way, scouring all of the settled debris from the tank floor. The ACU-DRUM’s flushing sequence can also be controlled by an electronic or hydraulic release mechanism if preferred to the float operated mechanism.